Toshiba Digital Handset with Large LCD Display Features includes - 14 Programmable keys with dual function LED's. 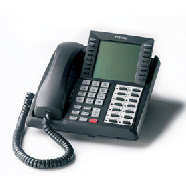 The phone has Hands Free dialling and speech and a large display for system quick dial features. This phone can be used on the Toshiba DK280, CT, CTX, CIX, Strata DK280, Strata CT, Strata CTX, Strata CIX, Strata IP-CTX and the Strata Pure IP-CIX telephone systems.